PM Modi inaugurated the 135-km-long Eastern Peripheral Expressway that envisages signal-free connectivity between Ghaziabad, Greater Noida, Faridabad and Palwal and will ultimately decongest the national capital. New Delhi: Prime Minister Narendra Modi inaugurated two key expressways today, one to cut down on travel time from Meerut to Delhi, the other to help reduce pollution in the national capital. But his address at Baghpat, Uttar Pradesh, next door to Kairana where assembly elections will be held today, touched upon what are seen as the key election issues. The Rs 7,500-crore, 14-lane Delhi-Meerut Expressway will cut down the travel time between the two cities to 40 minutes from the current two-and-half-hours. The Rs.11,000-crore Eastern Peripheral Expressway, India's first smart and green highway, will help around 50,000 vehicles travelling up to Jammu and Kashmir, to skirt Delhi. In the morning, PM Narendra Modi, accompanied by transport minister Nitin Gadkari, held a huge roadshow that marked the inauguration of the first phase 14-lane Delhi-Meerut Expressway, built at a cost of Rs 842 crore. Travelling on the 9-km stretch to the UP Gate, he waved at the crowds assembling since 8 am. Then he took a chopper to Baghpat. 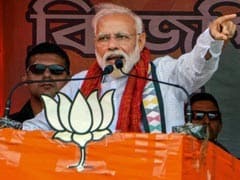 At the meeting in Baghpat, next door to Kairana, where assembly elections will be held today, PM Modi touched upon the key issues affecting the area, including cane prices, special commission for Dalits and law and order. Anticipating an indirect campaign speech, the opposition had complained to the Election Commission about a possible violation of the model code of conduct, but it was turned down. The Delhi-Meerut Expressway -- which will do away with 31 traffic signals currently on the Delhi-Meerut road - has been described by PM Modi as "road to freedom from pollution". The 9-km stretch from Delhi's Sarai Kale Khan to UP Gate, would help reduce congestion on roads leading to Noida and Ghaziabad. The total length of the project is 82 km, of which the first 27.74 km will be 14-lane, the rest will be a 6-lane expressway. The project, which is being built in four segments, will be fully completed by March 2019. The segments will be Nizamuddin Bridge to UP Border, UP Border to Dasna, Dasna to Hapur and Hapur to Meerut. The 135-km Eastern Peripheral Expressway envisages signal-free connectivity between Ghaziabad, Greater Noida, Faridabad and Palwal. The expressway has been built in a record 17 months. Its foundation stone was laid by PM Modi in November 2015. Around 2 lakh vehicles, including trucks and commercial traffic, are expected to ply on the expressway without entering the national capital, which will not only decongest Delhi but also help reduce pollution by 27 per cent. It will help divert at least 50,000 vehicles a day. With the country's first highway lit by solar power and provisions of rain water harvesting, the 6-lane highway will showcase 36 national monuments and 40 fountains. Nearly 2.5 lakh trees have been planted along the highway on both sides. The interchanges have been developed architecturally, with landscaping and fountains. Some of the monuments' replicas are of the Ashoka Lion, Ashoka Chakra, Konark Temple, Jalianwala Bagh, Gateway of India, Qutab Minar, Char Minar, Lal Quila, Kirti Stambh, India Gate, Hawa Mahal and Gujarat carvings. The inauguration of the Eastern Peripheral Expressway took place after the Supreme Court set a May 31 deadline. During a hearing of an ongoing case of pollution in Delhi earlier this month, the upset judges asked, "Why are we waiting for the Prime Minister to inaugurate it?" The court was told the inauguration, due in April, was put on hold because of the PM's prior commitments.